The Wilderness Reserve is pleased to announce some exciting hunting packages for 2017. These exclusive combo packages are available for 5 days/4 nights and are designed to challenge your outdoor passions and competitive spirit. Choose from a variety of options to create your ultimate outdoor adventure. These limited hunting packages include meals and lodging, guided hunts and our no game, no pay policy guarantee. Our 5,500 acre private ranch includes forests, marshes, and fields giving hunters the challenge of a fair chase hunt. If you love the outdoors and are seeking a unique challenge for 2017, we hope you consider the opportunities at The Wilderness Reserve! This package is designed with the hunting enthusiast in mind. Set your sights on a trophy whitetail and complete your journey with a cow elk. This is a excellent opportunity to harvest two big game animals in one excursion. Double your hunting pleasure during 5 days of adrenaline-pumping action exploring our vast wilderness! Encounter the thrill of a big game hunt and the exhilaration of a pheasant hunt. There are several big game options to choose from between Rocky Mountain elk and whitetail deer at various sizes. This gives you the chance to experience two distinct hunts in one expedition. Master the forests and marshes to harvest your trophy and finish in the uplands with a classic pheasant hunt! This package is perfect for the eager hunter and devoted angler. We combined two great outdoor pursuits into one action-packed trip. In our fish & hunt combo package, you have your choice of a trophy whitetail deer or Rocky Mountain elk. After the rush of harvesting your trophy, revel in line-zipping action on the water with a guided fishing trip! Score big in the wilderness and on the green in one visit. This is a fantastic mix of activities for a personal challenge. After an inspiring hunt for your trophy whitetail or elk on our impressive property, savor 18 holes of golf at Timberstone Golf Club! Timberstone Golf Club is ranked in the Top 100 courses in the country. The Wilderness Reserve is excited about our special packages for 2017, and we hope to see you this year when booking your hunting trip. For more information on our 2017 hunting packages and pricing, please download our 2017 brochure. We look forward to providing you with a premier outdoor excursion! Get your free brochure on our hunting packages and rates today! Commemorate Your Hunt with a Big Game Trophy Mount! You have booked your 2015 guided hunt at The Wilderness Reserve, and are eagerly anticipating the excitement and thrill of harvesting the big game trophy of a lifetime. Finally, the time comes and your dream of a trophy is realized amidst the beautiful forests of this vast reserve. Your guide was so helpful, the experience was wonderful, but now what? Most hunters dream not just of a successful harvest, but of displaying your skills on the walls of your home. Deer and elk mounts are a great way to keep the memories of the hunt alive, and always inspire conversations where you have the chance to brag about your trophy. But you don’t want to wait until the hunt is over to consider a professional mount! Full Mount: This is pretty rare, and many taxidermists aren’t equipped to handle this type of trophy display. This is also the most expensive option, and requires extra care during the hunt. Half Mount: This style is also fairly uncommon, although slightly easier and more affordable than the full manikin. Shoulder Mount: The most popular deer and elk mount includes the lower neck and the start of the torso. It allows great flexibility for tilt and antler display. Neck Mount: Neck mounts include only the neck and head, which saves a bit of expense, compared to the shoulder mount, although it limits the display a bit. Antler Mount: This is the most affordable option, and presents many options for creative display, while taking up the least amount of display room in your home. Past the type of mount, you may have preferences about angles and the way the mount is displayed. A back-tilt bugling mount for elk is a wonderful way to convey a sense of action, while capturing the nature of this majestic creature. The tilt of a head, nose up or down, and other such decisions may have to be made with consideration of the rack, but you should still be prepared with the general idea of what you would like because this will likely drive your choice of taxidermist. The last thing you want, after investing time and money to harvest the big game trophy of your lifetime, is an unsatisfactory mount. This is why it is important to find a professional taxidermist that you can trust to commemorate your experience. Here at The Wilderness Reserve, this is easy because one of our experienced big game guides, Jim Beenken, is a master of creative wildlife art, and provides a variety of taxidermist services through Wildlife Expressions, Inc. Also, the fact that our guides are well-trained in retrieval and capering ensures that your buck or elk will be properly taken care of before sending off to be mounted. The time to seek out the best professional is before the hunt, because they can often give you tips and styles to consider that will affect the hunt itself. For example, you don’t want to cut the neck or use a rope because you could reduce the chances of an attractive mount. This also ensures that your harvest will reach the taxidermist as fast as possible, which is best for quality. And if you are planning a hunt away from home, you will need to make plans for shipping or retrieval, which will factor into the final expense. When selecting a wildlife artist for your mount, look for someone who has examples of their work at hand. It’s one thing to see pictures online and another to get up close and personal to the mounts. Seek out referrals, or ask for recommendations. You will also want to discuss pricing and time frames so that you know what to expect. And don’t forget – cheaper is rarely better! Enjoy the Hunt of a Lifetime at The Wilderness Reserve! https://thewildernessreserve.com/wp-content/uploads/trophy-mount-to-commemorate-hunt.jpg 635 845 TWR Staff https://thewildernessreserve.com/wp-content/uploads/TWR-Logo-Large.png TWR Staff2015-03-06 23:48:502017-07-17 09:12:44Commemorate Your Hunt with a Big Game Trophy Mount! Hunting elk, even in the best of weather and conditions, can be challenging and often leaves the hunter unsuccessful. Elk seem to have a magical ability to avoid the eager hunter on public land, which can be frustrating after investing all that time and money in the effort. Late season elk hunting is no different, but brings its own set of challenges and rewards, whether on public land or a hunting preserve like The Wilderness Reserve. The key to a successful harvest, no matter the game you seek or the time of the year, rests on the ability to understand and predict animal behavior. This can take years to grasp, but there’s no better time than the present to start giving it a shot and fine-tuning your elk intuition. So what are the majestic bulls up to at this time of year? Typically, the snow is beginning to push the elk downhill from higher elevations, where the snow has buried the food. As they browse on fir needles and paw for patches of hidden grass, they turn a lighter color of brown or gray as their coat of hair thickens in response to the cold. Elk are also gathering together in the large herds they will remain in through the winter. As with all Northwoods wildlife, elk are busy in the fall bulking themselves up for the winter season. The bulls don’t shed their antlers until later in the winter or early spring, so they still need to take in those extra calories to maintain that weight. Knowing where the elk are foraging for food can be the key to successful late season elk hunts. There are naturally a different set of challenges to hunting elk during the late season. Many elk hunters rely on elk calls for the hunt, and this isn’t an effective tool post rut. Physically, the hunt is harder because the hunter faces wading through deep snow and withstanding cold temperatures for long periods of time. Predicting where the big bull will be is only part of the trial. The physical requirements of a late season hunt aren’t to be underestimated. Elk can walk for a dozen or more miles a day, covering great distances for food. This means that the hunter must be prepared to hike through deep snow, or be smart enough to accurately predict where the bull will be at what time of day. As with anything, though, a bigger challenge means a bigger reward! If you are hunting public land, the late season means that there are less hunters in the woods. The elk are less likely to be disturbed in their daily movements by the presence of humans. As the big bulls are often successful in eluding early season hunters, you have to chance to harvest a real trophy! The forest itself at this time of year is a breathtaking reward. With nothing but trees and nature surrounding you, the peacefulness of the forest is magnified by the covering of the snow. Sounds are muffled more, and nature’s beauty is only enhanced. And the white coating allows hunters an easier view, making the coloring of a bull stand out that much more. If you brave the late season hunt and beat the challenges, the sense of accomplishment when you succeed will be that much greater! How to master the challenges of late season hunting? Be flexible and adapt! Although elk calls aren’t as effective, this is a great time of year to employ tracking techniques. Whereas a forest floor covered in fallen leaves and debris can easily hide tracks, as well as make quiet movement impossible, a covering of snow makes an elk’s path stand out clearly. Watch for tracks that have sharp edges and no debris in them as these are indicators of freshness. Look for the path between feeding and sleeping spots. Watch for fresh rubs on the trees, as these are typically in the middle of the bulls daily range and it’s unlikely the path has changed significantly yet. Also check clearings for droppings and signs of freshly eaten vegetation. Bulls tend to be at slightly higher grounds than the cows, so adjust up after spotting a cow herd. You are more likely to find them on south facing hills than the north side. These areas tend to be warmer with less snow, and thus more food. Most importantly, try to think like the bull because interpreting his behavior accurately can save you from miles of hiking without even a glimpse of your trophy. And when you succeed with a late season elk hunt, pat yourself on the back because not all hunters are dedicated enough and brave enough to attempt this challenge! Elk hunting packages at The Wilderness Reserve are available from September through Christmas, with late season hunts offering a unique experience for hunters of all abilities. Spotting a proud bull through the snow-tipped branches of the forest is a thrill, and harvesting your trophy is the memory of a lifetime! And nothing is as cozy as returning to a secluded Northwoods cabin to spend the evening recounting the day’s adventure in front of a roaring fireplace! Experience the wonders of elk hunting for yourself on 5,500 acres of quality managed habitat at The Wilderness Reserve! Book Your Guided Elk Hunt Today! Hunting is one of the most time-honored traditions, linking all mankind over the ages. Throughout history, the chase of wild game was done for necessity, sport, and excitement. Hunting preserves, like The Wilderness Reserve, seek to keep these outdoor traditions alive, and to enhance the experience for the next generation. However, with public land hunting and land lease options available, some question the benefits of preserve hunting. The reality is that preserves offer opportunities to individuals that might otherwise never have the chance, and a higher level of quality game than can be found on public lands. The entire experience of hunting is improved on a preserve, and the idea that it is more expensive or ‘easier’ than public land hunting is often overstated. If you haven’t yet enjoyed hunting The Wilderness Reserve, read on to see why you should make this a tradition! Hunting preserves bring a successful hunt into the grasp of those that may otherwise miss out. Perhaps you have a busy work schedule, and can’t get away long enough to find a solid hunting spot and track your game. And traditional hunting seasons are confining for all. Or maybe you would like to introduce your wife and/or child to the joys in a more controlled environment. A hunting preserve may well be the answer to your hunting obstacles! High fence operations work well for hunters of all ages, abilities and challenges. Only at a preserve can you hunt in a group comprised of a first-time youth shooter, a well-experienced sportsman seeking a challenge, and an aged hunter who would prefer to avoid the physical demands of public lands. Disabilities can easily be accommodated in a quality managed setting, and experienced guides are available to assist newcomers to the sport. If you are looking to capture the trophy of a lifetime, a hunting preserve is your best option! Outside these unique hunting grounds, deer and elk populations are met by eager shooters looking to capture the biggest buck or bull. This can sometimes mean that the strongest genes are disappearing from the forests, leaving smaller males with lower quality genes to thrive and repopulate. On a hunting preserve, quality big game animals are the winners and the breeders. This means that, when you are hunting at a quality managed preserve like The Wilderness Reserve, you are chasing trophies that you might never even have the chance to see on public lands. And with professional guides available to offer insight into the animal’s patterns, your likelihood of success is greatly improved. Still, as a The Wilderness Reserve team member says, you have to put in the effort if you want to harvest a trophy animal. Some hunters may believe that preserve hunting is not as challenging as hunting on public lands or private property. That belief is far from the truth, especially when it comes to large reserves like The Wilderness Reserve, which boasts of over 5,500 acres of managed forest, marshes, and fields. It is possible, without guidance, to wander the acres without seeing a whitetail deer or an elk for days. The challenge is still there, but the chances of harvesting the trophy is higher. Win-win situation for hunters of all abilities! The second myth about hunting preserves is the expense. In reality, a trip out west to hunt big game could cost considerably more than a trip to The Wilderness Reserve, especially if you live in the Midwest. And you can’t simply fly to Colorado, get off the plane, harvest an elk, and head home the next day! Prep time, tracking, finding an animal and actually capturing the trophy all add up to more time away from work or your family, and more expenses. Travel, lodging, food, licenses, equipment – it all adds up. At The Wilderness Reserve, your guided hunt trip is all-inclusive, including lodging in one of our secluded cabins, meals, guide service and quartering and capering of the game. You get ‘Out West’ big game hunting at a convenient location for an affordable price. No hidden fees or unexpected costs. And we have the amenities to ensure a memorable experience that will have you eager to return! Hunting for a trophy elk can be one of the biggest challenges, no matter how experienced of a sportsman you are. The elusive bulls are difficult to find and uncanny in their ability to evade, and elk hunts are all too often unsuccessful on public lands. 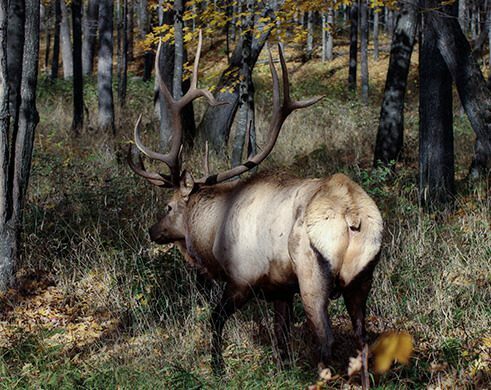 At The Wilderness, you will find trophy elk exceeding 400” B&C, freely roaming 5,500 acres of spectacular forests in Northern Wisconsin and Upper Michigan. And with our experienced guides, you are sure to be presented with the opportunity to harvest a bull bigger than you had ever hoped! Hunting preserves have the unique ability to inspire a lifelong love of nature and passion for hunting in youth. Hunting public lands can mean long periods of waiting before even seeing the first whitetail, and your young one may grow impatient and lose interest. With preserve hunting, new hunters will be caught up in the excitement and amazed with each sighting of huge trophy deer, many more than 200” B&C and a few 300″B&C. And with the wonders of nature all around you, it’s impossible to ignore the call of the wild! Hunting preserves play an important role in the longstanding tradition of pheasant hunting as each protects a piece of our natural resources and preserves forested lands. Shrinking rural habitats often mean smaller bird populations, and hunting preserves fight this obstacle. In fact, the North American Gamebird Association & Foundation discuss the value of preserves, saying “Hunting preserves offer the opportunity for young and old alike to savor the flavor of bird hunting as it once was”. The Wilderness Reserve is happy to accommodate pheasant hunters of all abilities and skills levels. Are you ready to try out a new bird dog, or fine tune a young ones skills? 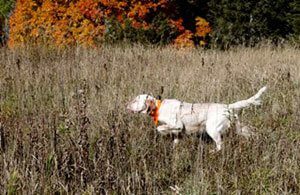 A pheasant hunting preserve is the place to do it, with the assurance of presenting the dog with its prey. Missing out on pheasant hunting because you don’t have a well-trained furry friend to assist in the hunt? The Wilderness Reserve offers dog/guide packages to ensure a successful experience! No matter the wild game you seek to chase, The Wilderness Reserve is your Midwest hunting destination! Check out our Ranch Today! Experienced sportsmen know that the most successful hunters are those that study and understand the game they hope to capture. Knowing the animal’s daily movements, habitats and behavior gives you an edge in the wild, and creates an unspoken connection between the hunter and the hunted. And if you are hoping to experience the successful thrill of a Rocky Mountain elk hunt, it’s helpful to interpret the creature’s communications. Like all animals, Rocky Mountain elk have a diverse set of communication signals with different meanings. For elk, communication involves vocal calls, scents and movements that vary, depending on the time of year. There are four main types of elk calls, each used with different pitches and in different combinations to convey the intended message. Bugles: This is the most familiar of elk sounds, as it can be heard over long distance. Bulls bugle to announce their presence to competitors and cows, sometimes to indicate their strength and readiness to fight and sometimes to impress the cow. Challenge calls are often followed with grunts or chuckle sounds. Chirps, mews, and squeals: These softer sounds are typically used to communicate in everyday conversation. High-pitched squeals: This is the distress signal from a newborn calf to its mother, and the cows can identify their offspring by their individual squeal. Barks: The barking noises are warning signals, given sharp and loud. A cow will sound off a long, drawn out mew when she’s injured or trapped. The bugles of each bull are singular to that animal, and can be useful to hunters in locating the bull as well as determining the size because older, larger bulls will have a deeper bugle. With such a wide range of sounds, it can take some time to gain insight into elk behavior. But it is an extremely useful tool for the hunt, and is worth the time to study and learn as much as possible. Many hunters believe your chances of capturing a trophy elk depend on mastering the elk calls. But opinions vary greatly about which calls are the best to use, and how and when to apply this hunting technique. It really comes down to the individual hunters’ style, as well as your ability to perform the calls accurately. If you aren’t good at it, you shouldn’t bother because a call done wrong, or used at the wrong time, can have the opposite of intended affects. The best bet is to practice at home with a variety of calls, and consider each approach in relation to your hunting style. Whether you choose a diaphragm mouth call, a grunt tube, or an open reed style call, make sure you have plenty of practice in! Using calls during the rut is said to be most effective, but using a raking call pre-rut can attract a bull, and bugle calls pre and post rut can alert you to the bull’s location. Be careful with bugle calls because the bull might move in the opposite direction. If you are near a herd, using an excited cow call can draw the bull in. The Wilderness Reserve offers a convenient Midwest location for out West quality big game hunting! With a guided elk hunt at The Wilderness Reserve, you can enjoy the chance to catch the trophy of a lifetime on 5500 acres of premiere hunting land. Hunt packages include 3 nights lodging in one of our secluded cabins, with its own private lake for your enjoyment. Ready to experience the excitement of a big game hunt for yourself? Book your Trophy Rocky Mountain Elk Hunt Today! The debate about hunting whitetail deer from the ground or from elevated positions brings many different views. Some feel that elevated hunting positions require less skill, reducing the true sportsmanship of the hunt. Others argue that it requires more skill and preparation for the hunt. But most hunting experts agree that positioning yourself in an elevated blind or stand greatly raises your chances of capturing a trophy whitetail buck. Hunting from an elevated position brings many advantages. Whether you choose a raised stand or box blind, you gain a unique observation point that allows you to study the behavior and learn more about the deer’s patterns. The larger range of view increases your chances of spotting that trophy buck, while giving you the advantage of a downward trajectory shot. Your direct view won’t be blocked by brush or trees, and it’s hard to argue with a clearer and wider view. If you choose to hunt from a tree stand, your scent is elevated and out of the direct path of the bucks. An elevated box blind further masks your scent, while also concealing your movement and muffling any sounds you make. This affords you almost total invisibility for your hunt. And, especially when hunting in the colder climates of Upper Peninsula and Northern Wisconsin, you will appreciate the protection from the elements that will allow you to hunt longer in greater comfort. If you are hoping to introduce your child to the wonders of whitetail deer hunting, an elevated box blind is highly recommended. Children can get impatient with long periods of waiting in between action, and the blind’s walls can mask their antsy movements. Being up off the ground can add to the excitement of the hunt for young hunters, and they will appreciate the unique view of the wildlife and environment. Box blinds usually require more permanency in location, and it’s recommended that this hunting platform be used when you intend to hunt the same location for several seasons. Elevated stands, on the other hand, can be usually be put into place easier, fairly quickly and with little noise to alert the deer of your presence. Choosing the right location for your stand is crucial to your hunting success. The first priority should be finding a location that the game congregates at. If you are experienced at reading the whitetail deer signs, and choose your spot accordingly, you will have a better chance at capturing your trophy. But don’t ignore the environmental factors around you! Consider what time of day you will be hunting. Where will the sun be? You don’t want to be blinded by looking directly into the sun, nor do you want to be highlighted by the sun at your back. Whitetail deer don’t see well in direct light, so that allows you some leeway in selecting your spot. Give attention to wind patterns – even with an elevated position, you don’t want to be upwind from where the deer will linger. Make sure to find a straight tree that you can climb safely and that allows you a clear view of the terrain. Recommendations regarding the appropriate height of box blinds and elevated stands vary from 5 feet to 20 feet off the ground, but regardless of height, it’s crucial to make safety a priority. A fall from even a few feet off of the ground can leave you with a broken arm and down for the hunting season. Purchase a safety strap and know how to correctly follow safety procedures. Stay alert – you don’t want to nod off and find yourself on the ground. Educate young hunters on climbing and rifle safety to ensure a positive hunting experience. Experience the thrill of big game hunting at a convenient Midwest location. With 5,500 acres of Northern Wisconsin and Upper Michigan terrain and a variety of blinds and stands to fit your hunting style, you will find a challenging environment to fit any level of experience. The Wilderness Reserve’s big game hunt packages are all-inclusive, and you will love your stay in one of the secluded cabins, each on its own private lake. Ready to capture the whitetail deer or elk trophy of a lifetime? Book Your Trophy Elk or Whitetail Deer Hunt at The Wilderness Reserve!